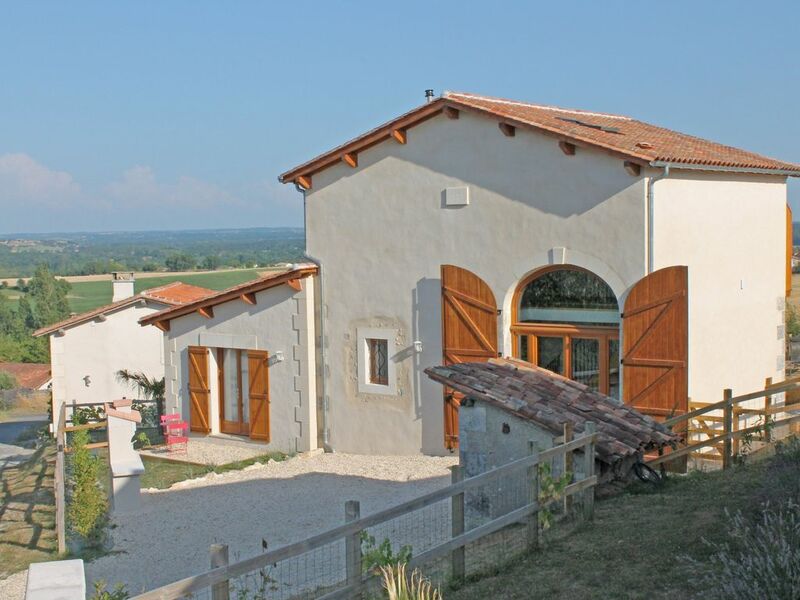 Le Pressoire de Pierre is situated at the top of the hill in the little hamlet of Puygironde. It is It is renovated from a barn used as an old wine press and retains some of the character features. Inside, the property has been entirely refurbished to provide an elegantly finished home, perfect for relaxing and enjoying your holiday. The main living space is upstairs, benefitting from the wonderful views that stretch out across the Charente and Dordogne valleys. The stairs take you up next to a large glazed archway, to an open plan living space. A fully equipped kitchen provides you with all you will need to enjoy your holiday banquets. Microwave, dishwasher and washing machine/dryer are all included. The dining area ensures you can enjoy those meals in style, or alternatively open up the two sets of double doors out onto the balcony and dine in the open air - with views to remember! The living area provides further comfort and practicality, with TV, DVD player, Stereo, wifi - plus of course nice comfy sofas! A small but pleasantly kept garden is fully enclosed to keep the little ones safe. Sun loungers ensure you can enjoy the long summer days and the BBQ helps out with the long summer evenings! All of the facilities and services at Longeveau, including the swimming pools, are only a short stroll down the lane - 5 minutes for grown ups and only a little longer with little ones! Pressoir de Pierre features an en-suite for each of the the three bedrooms. Converted from an old barn, this property has been extensively modernised. Pressoir de Pierre is located a short stroll up the road from Le Manoir de Longeveau. Longeveau is nestled on the Charente / Dordogne border, in a valley designated by the Michelin guide as ‘a place of special beauty’. The hamlet offers a selection of thoughtfully renovated stone cottages, with a superb range of facilities including golf, tennis, restaurant & bar, plus children's play areas, a summer creche and plenty more.